The lacquerware artisans present an innovative center piece. The interior of this curving piece is covered with an eggshell mosaic and the sides and bottom are lacquered using lacquer techniques handed down over generations. The result is an original center piece with a modern Asian flair. For decorative purposes only. 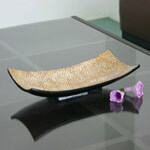 This center piece will add sparkle and beauty to the interior of any home. Size: 25.5 cm W x 6.0 cm H x 13.0 cm D.